The extra long skinny scarf combines 8 to 10 different chunky yarns including handspun and novelty yarns. Fibre content varies, but may include silk, alpaca, yak, llama, camel, mohair and a variety of sheep breeds. Made of extra bulky and artYarns, the dreadlock scarf can be worn knotted at the ends as shown, or left loose to dangle. Each one is unique. 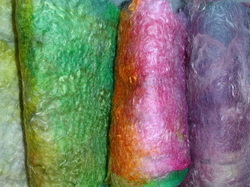 Yarns are wrapped at the back of the neck with silk to ensure comfort and security. Cobweb scarf is 8 feet long for maximum wrapping. Mohair along the edges gives an ethereal quality. This scarf is shown in the "rainbow" colourway. These scarves are only made during the summer months, so be sure to get yours early. Available in combinations of merino, polworth, mohair, alpaca and silk. 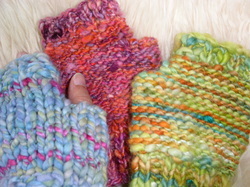 Fingerless mittens in handspun yarns. Available in most colourways. 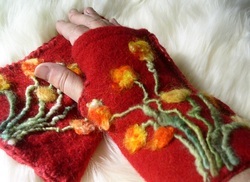 Made from upcycled sweaters and needle felted designs, these fingerless arm warmers will keep you texting all winter.